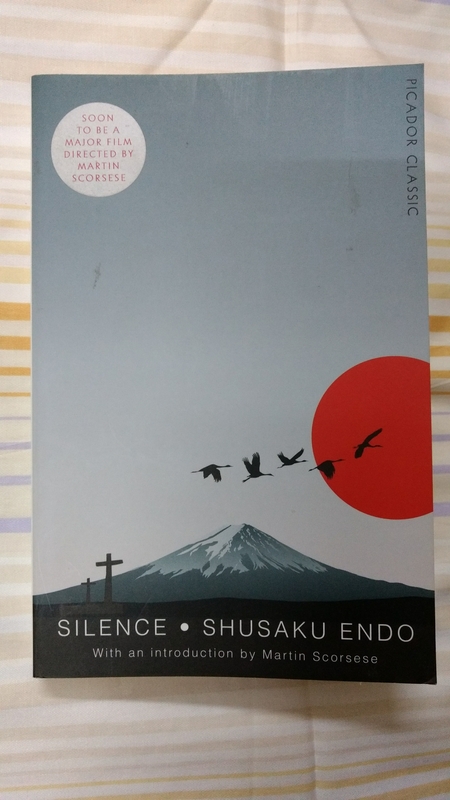 I discovered Shusaku Endo’s ‘Silence‘ through Bellezza’s review of it. I have wanted to read it since and I am glad I finally got around to it. ‘Silence‘ tells the story of Father Sebastian Rodrigues, a Portuguese Jesuit priest who travels to Japan to carry missionary work, during the middle of the 17th century. The situation in Japan is dangerous and is not conducive to missionaries. Father Ferreira, who was Father Sebastian’s teacher, (it is customary to use the second name with the title ‘Father’ and so it should be ‘Father Rodrigues’ here, but I like ‘Father Sebastian’ more and so that is how I am going to call him) had been there for years, but recent reports suggested that he has been arrested, tortured and forced to apostatize – deny his faith in Jesus and his Church. Father Sebastian knows the dangers awaiting him but still makes the trip alongwith two fellow priests. Once they reach Japan, they are hidden in a village near a mountain, have to meet Christians and conduct services in secret and hide when government officials who are hunting for missionaries and Christians turn up. The story describes the perils and challenges they face, how their faith is questioned and tested and whether they are able to overcome these challenges and pass these tests or not. ‘Silence‘ is a book about faith. There are beautiful passages in it on the nature of faith, its beauty and profound depth, the ways it can be tested, the real troubling questions that believers can face during challenging times. I loved these passages. It was fascinating to follow Father Sebastian’s journey of faith into an alien land, the Japan of the middle 17th century. The book has fascinating descriptions of the Japan of the middle 17th century – the everyday life, the culture, the power structure. It is fascinating to ponder on how a predominantly Buddhist country can also have a feudal system which differentiates clearly between the haves and have-nots and crushes people at the bottom of the social pyramid – something which is at stark variance with the beautiful, peaceful image that Buddhism has today. The book also descibes how a religion has to change shape and evolve in interesting ways to adapt to a new culture and take into its fold new believers. I was hoping that the story would end in a blaze of glory like a Hollywood movie – either that Father Sebastian would convince the hostile Japanese about the glory of Jesus or he will be tortured and die, leaving the world gloriously like a martyr. But, the book had a third ending, (Martin Scorsese says in his introduction to the book – “his Japanese captors have a keener sense of understanding of Christianity than he realizes“), one which I didn’t anticipate, a subtle ending which makes one think and contemplate. If Marty hadn’t got into movies, he would have made a great writer 🙂 It is amazing how a great artist’s talent manifests itself in many different ways. Martin Scorsese adapted Endo’s book into a movie. It got rave reviews from critics. It got included in AFI’s (American Film Institute) ten best films of the year. But it was ignored during Oscar time and it bombed in the box office. It is sad. This fan will however be watching it. I know that it will be great – Marty’s adaptations always are. I have to say one last thing. I read Mary Doria Russell’s ‘The Sparrow‘ a couple of years back. It had the exact same story. A Jesuit priest goes to a hostile country to preach and do missionary work. And has a crisis of faith there and wonders why God has forsaken him. There are, of course, differences. In Russell’s book that character is called Father Emilio Sandoz. And he doesn’t go to Japan, but to outer space, to another planet 🙂 And there is a fascinating character in the book, a scientist called Anne Edwards, who the author says was modelled after herself, a character I loved. In her interview at the back of the book, Russell doesn’t mention Endo’s book. She says she wanted to write about what happened when two civilizations collided together for the first time in today’s world. I don’t know whether Russell read Endo’s book, got inspired and adapted it with a futuristic plot, with the soul of the original story intact. I think that is what she did. But I don’t know for sure. I might also just be imagining things. If you do get to read both the books, I would love to hear your thoughts. I will leave you with one of my favourite passages from the book. Yet his perplexity did not come from the event that had happened so suddenly. What he could not understand was the stillness of the courtyard, the voice of the cicadas, the whirling wings of the flies. A man had died. Yet the outside world went on as if nothing had happened. Could anything be more crazy? Was this martyrdom? Why are you silent? Here this one-eyed man had died – and for you. You ought to know. Why does this stillness continue? This noon-day stillness. The sound of the flies – this crazy thing, this cruel business. And you avert your face as though indifferent. This…this I cannot bear. Have you read Shusaku Endo’s ‘Silence‘? What do you think about it? Thank you, Resh 🙂 Yes, it is calm in parts, but it also raises some interesting complex questions. I loved that sentence too – glad you liked it. I haven’t read this one yet, but my father recently enjoyed it. There is also The Book of Strange New Things, a story that sounds rather like The Sparrow. I hope you get to see the movie soon! Glad to know that your father enjoyed it, Lindsey. Thanks for telling me about The Book of Strange New Things. It looks fascinating and I will look for it. I can’t wait to watch the movie version of Silence! Lovely review, Vishy. It sounds like a book I’d like to read. I thought I had it but it’s another one Deep River. But I have The Sparrow. I read one if his books for the Literature and War readalong and remember I was surprised to find out he was a Christian. I then also got his book on Jesus. Thank you, Caroline 🙂 Hope you get to read this book and like it. Would love to hear your thoughts on it, if you get to read it. Deep River is an interesting title. I will look for it. Hope you get to read The Sparrow. I just took it down from my shelf and read some highlighted passages and I loved them. Need to check out other books by Mary Doria Russell now. She writes so well. Great review, Vishy, and food for thought. It sounds as if Michael Faber’s The Book of Strange New Things is on a similar theme. Like The Sparrow it features a proselytising priest on a different planet and his crisis of faith, but it also conjures the wife left behind. It’s very good on the emotional cost of such a quest. Thank you, Lisa 🙂 Thanks for telling me about Michael Faber’s book. I would love to read it and compare it with The Sparrow. That will be a fun thing to do. What a lovely review, Vishy. I’ve wanted to see this movie and don’t know why I haven’t tried to read the book beforehand. Your review has encouraged me to read this one very soon! Thank you, Marjorie 🙂 Hope you like the book. I will look forward to hearing your thoughts on it. Happy reading! I can’t wait to watch the movie!